The city of Las Vegas was founded in 1905 when 110 acres of land were auctioned off to the highest bidder. The first casino opened in 1906; by 1910, gambling was banned before the Nevada legislature made it legal in 1931. Many of the thousands of workers who worked on the Hoover Dam in the 1930s headed to Las Vegas for after-work fun and relaxation. The tallest building in Las Vegas is the Stratosphere Hotel tower, which is America’s tallest building to the west of the Mississippi River. The majority of the famed Las Vegas Strip is actually located in Clark County rather than the city proper. The average visitor stays between three and four nights, and more than 36 million people visit on an average year. The iconic neon cowboy statue is named Vegas Vic. There are more Cirque du Soleil shows permanently housed in Las Vegas than in any other single location in the world. With everything from intimate cabarets to poolside concerts and giant arenas, Las Vegas has all types of entertainment venues and something for all tastes. Most every big-name performer in music and comedy have played Las Vegas stages, many for extended runs. On any given night in Vegas, you might find a country music superstar playing to a crowd of 4,000 fans, a comedy legend reliving the good old days, and up-and-comers delighting crowds in smaller clubs. The tradition of live entertainment stretches back to early days of the boomtown in the desert. In the first decades of Las Vegas history, people stayed in dude ranches, the forerunners of the modern hotels—drawn by the promise of quick divorces and gambling. When the Hoover Dam was constructed in the 1930s, workers flocked to Vegas in search of fun and entertainment of all sorts. After World War II, resorts begin to spring up—one bigger than the next. By 1960, Frank Sinatra gathered his friends for fun and some drinks, eventually forming the Rat Pack and making Las Vegas a place of legends. Elvis, one of Vegas’s most iconic performers, first arrived in 1956 at the age of 21. He played Las Vegas shows many times over the years, eventually returning in 1969 for an extended run. Elvis has never really left the building, as interpreters and marriage chapel attendants carry on his jump-suited legacy. In the years following, all types of performers set up for long runs in Las Vegas, including divas like Cher, Celine Dion, and Bette Midler. The top names in comedy play in Sin City, and the roster of shows includes about any type of entertainment you could dream of—everyone from burlesque and show girls to family friendly Cirque du Soleil shows. One of the best examples of the best Las Vegas hotel and casinos, Rio Hotel really rocks into gear once the sun sets. 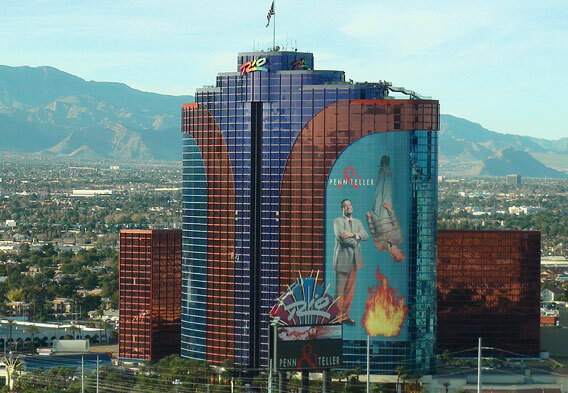 The first all-suite Las Vegas hotel, the Rio has hosted the top names of entertainment ever since it opened in 1990. When the Masquerade Show in the Sky opened in 1997, the Rio ushered in a new era of free Las Vegas shows. Today, its Entertainment Court offers a mix of shows and events to suit all types of Vegas visitors. Magic greats Penn & Teller bring their mix of comedy and amazing feats to the stage, not far from where the Platters and other kings of doo-wop sing their old favorites. Another club hosts Show in the Sky, a carnival show straight from Brazil, which happens steps away from the Chippendale's dance club. The Rio’s entertainment scene also includes the VooDoo Rooftop Nightclub, proving that the sky’s the limit for fun in the Las Vegas. Many other clubs have opened in Vegas over the years—most of the top hotels have a top-notch nightspot to match. Celebrity sightings, chic cocktails, and DJs keep the party going at these nightclubs. Leave it to Las Vegas to turn a pool into a party venue. Beginning in April and continuing into the fall, many resort pool complexes turn into adults-only pool parties, only moved outside during the day. These parties under the desert sun kicked off with Rehab at the Hard Rock in 2002. 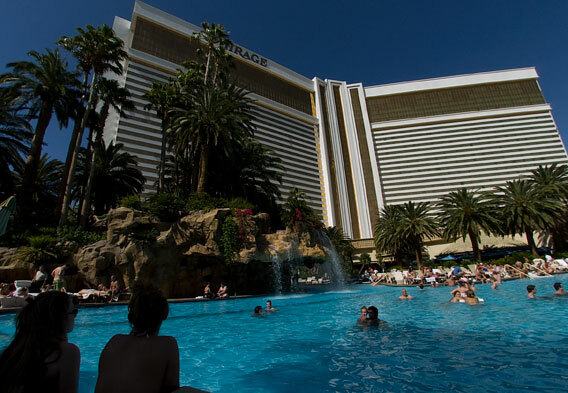 Since then, more resorts have added Vegas pool parties to their entertainment scene—turning poolside into the hottest place to party before the sun goes down.